Dr. A.P.J. 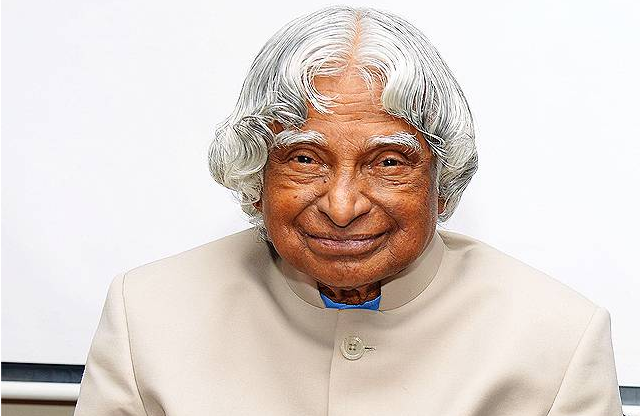 Abdul Kalam (Avul Pakir Jainulabdeen Abdul Kalam) was born in a poor Tamil Muslim family at Rameswaram District of Tamil Nadu on 15th October 1931. His father, Jainulabdeen, was an imam of a local mosque and a boat owner. His mother, Ashiamma, was a home maker. He was the youngest in the family with four elder brothers and a sister. Due to poverty he started working by selling newspapers at a young age to support his father. During his school days he was an average student but was very hard working and had a strong desire to learn. Mathematics was his favorite subject and would spend hours studying the subject. He did his schooling from Rameswaram Elementary School and graduated in Physics from St. Joseph’s College in Tiruchirappalli in 1954. A year later he moved to Madras and joined the Madras Institute of Technology and studied aerospace engineering. He wanted to beome a fighter pilot but his dream didn’t become reality and he was ranked ninth while the IAF offered only eight slots. Dr. Kalam directed Project Valiant and Project Devil that aimed at developing ballistic missiles using the technology of the SLV programme that was a success. Dr. Kalam succeeded K.R Narayanan as the 11the President of India. He served as the President of India from 25th July 2002 to 25 July 2007. He was affectionately called People’s President. He was honoured with Bharat Ratna, the highest civilian award, in 1997 for his contribution in the field of scientific research, development and modernization of technology in the defence sector of India. In 1981 he received the Padma Bhushan. Dr. A.P.J Abdul Kalam passed away on 27th July 2015, due to a massive cardiac arrest during a lecture at the Indian Institute of Management, Shillong.